Today we have a guest post from Andy at Bow Hunting Maryland. As his site name implies, Andy’s an avid bow hunter here in Maryland. He’s also quite handy, and has helped Fred and Kim on several projects around their house, including installing hardwood floors last summer. Andy asked if he could share an article on building the wood bow rack pictured below, and we obliged. If you’re interested in bow hunting in Maryland, or anywhere else on the planet, head on over to BHM and bookmark it for future reference. 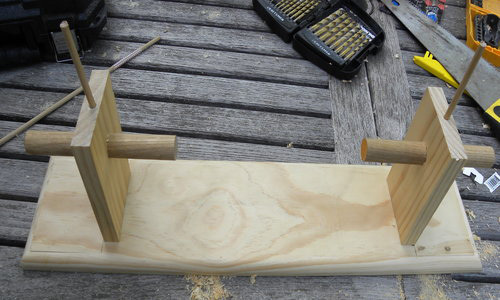 Building your own bow rack is an easy DIY project for any archery enthusiast. The materials that are needed will cost around $20 depending on your selection of wood, and everything you need can be found at the local home improvement warehouse. The whole project will take about an hour to build (excluding paint or stain) depending on design choice and skill level. 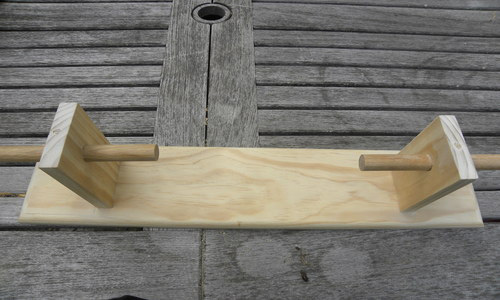 The simple bow rack shown in this post is made to hold up to 4 bows. 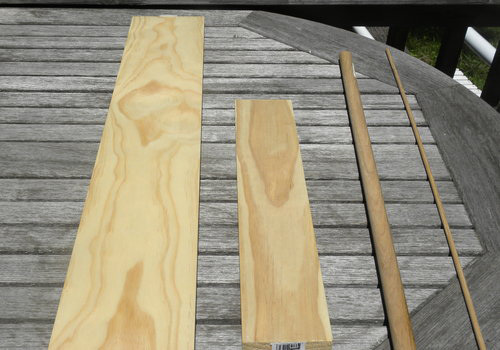 Step 2: Cut (2) 1×4 boards at 6″ long each. 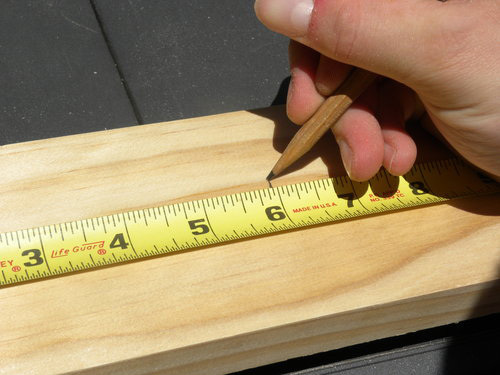 Measure from one end of the 1 x 4 that you just cut, 2″ in and 1 ¾” down and put an X where they meet. 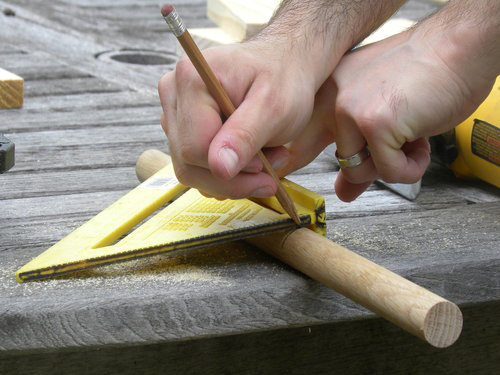 Step 4: Drill through the 1×4 with a 7/8″ spade bit. 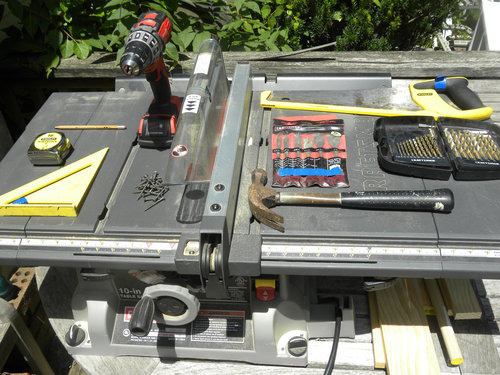 Take the 7/8″ spade drill bit and center it on the X. Remember it is important that these holes are straight and level otherwise your rack will be lopsided, and nobody wants a lopsided bow rack. Step 5: Add a creative edge to the backer board. This is the design step. 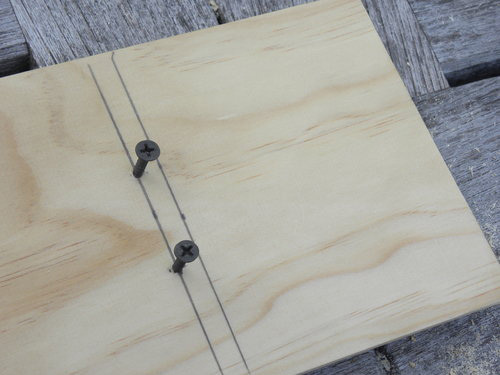 If you have a router and would like to put a creative edge on your backer board (1 x 6) now is the time to do it. I used a simple rounded edge bit to add some character. You can do anything you want with this step or leave it that way it is. 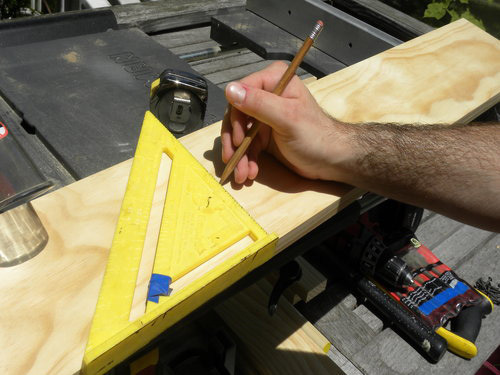 Measure in 4″ from each end of the 1 x 6 and draw a straight. 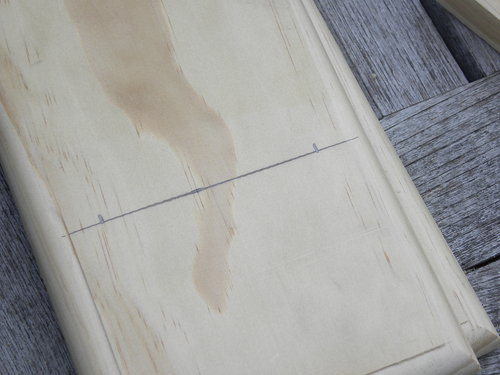 Then, measure down 1″ from the top and up 1″ from the bottom making a mark on the lines you just drew. 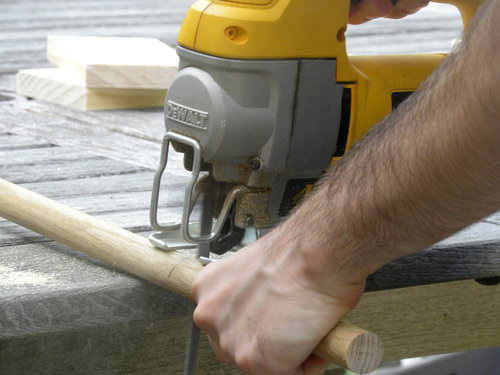 This gives you guidelines for mounting your 1×4 boards in the right places. This is important, otherwise the holes you drill in Step 7 will not line up correctly. 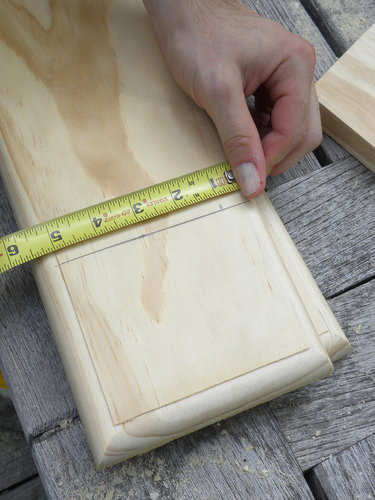 Flip over your backer board (1×6) and measure in towards the center 4 3/8″ from both ends and draw a straight line. Then, measure up 2″ and down 2″ along these lines and make marks. 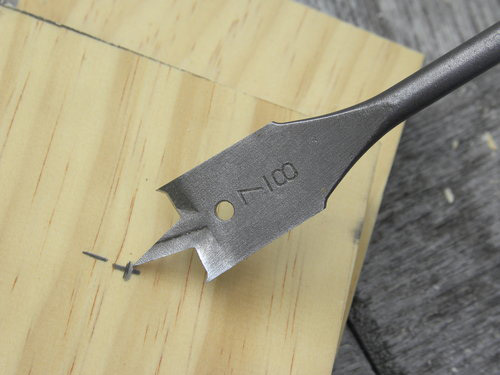 Take the 1/8″ drill bit and pre-drill each of these 4 marks that you just made. These give you pilot holes for mounting your 1×4 brackets. 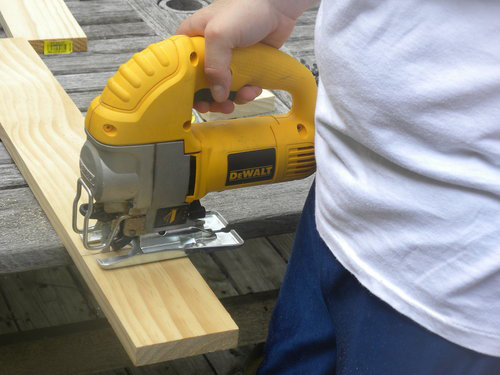 Take (4) 1 5/8″ drywall screws, start them from the back of the 1×6 into the 4 pre-drilled holes from Step 7. Then take your 1×4 brackets (one at a time) line them up to the guidelines you drew on the front of your 1×6. Screw one screw into the 1×4 and check to make sure you are still within your guidelines and screw the second screw in. You can either get someone to help you hold these in place while you screw them on, or use a clamp. Then repeat this for the second 1×4. Step 9: Measure, mark, and cut the dowels. 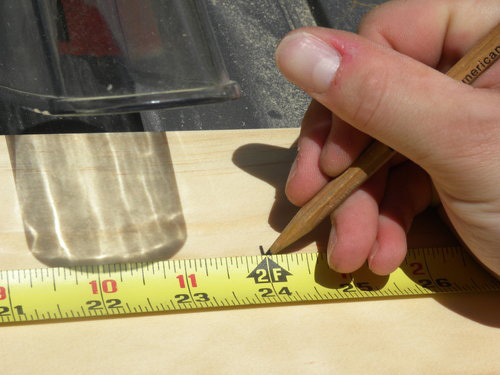 Measure 6 3/4″ on your 7/8″ dowel, mark and cut. You will need two of these. 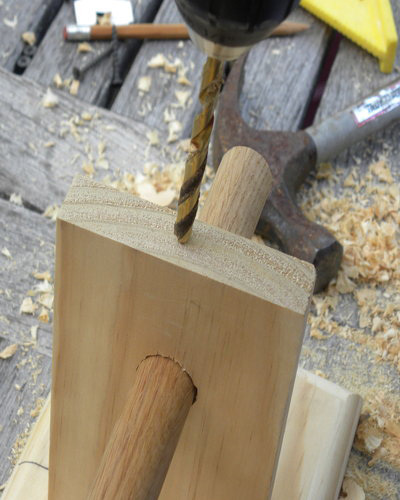 Step 10: Insert the dowel. 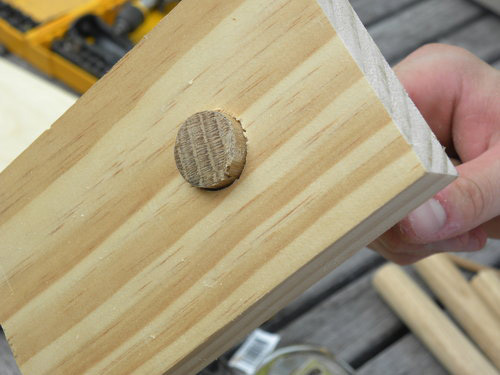 Slide your 7/8″ dowel through the hole you drilled in step 4. It should stick out 3″ on each side. Once you have it centered, mark it on each side. Place the rack flat and measure in 2″ from the end of the 1×4 on the top in the center (remember center is 3/8″ in from either side on any 1x wood). 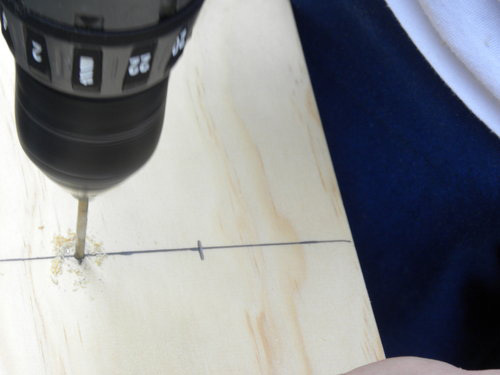 Take your 1/4″ drill bit on your mark and drill down through the 1×4 and 7/8″ dowel. This is probably the hardest step. It is very important to stay straight while drilling this hole as you want it in the center of the 1×4! Do this for both 1×4 brackets. NOTE: Most 1/4″ Drill bits are long enough to just reach but make sure you verify before drilling. Step 13: Trim the 1/4 dowels flush. 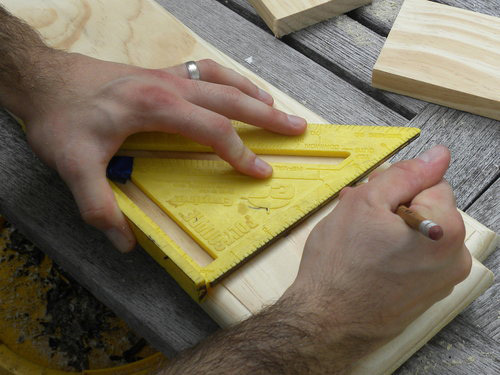 Take your 1/4″ dowel pieces that you just cut and tap them into the holes you drilled in step 11. They should be flush with the top of the 1×4, if they are not, they may not be all the way in. 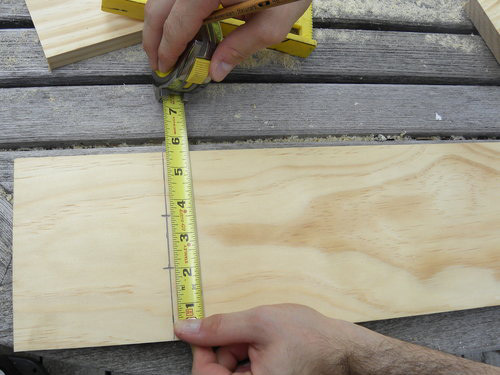 Otherwise, if you happen to measure a little long then you can just take a hand saw and trim them so they are flat. 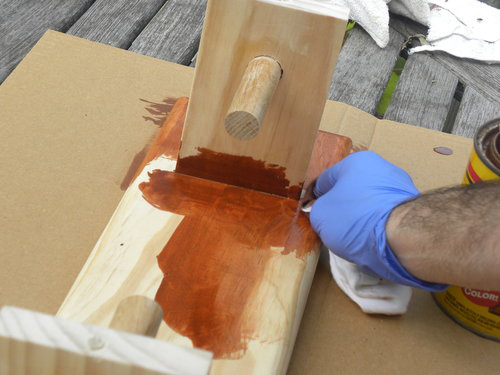 Sand your brand new bow rack smooth with a 220 grit sandpaper. 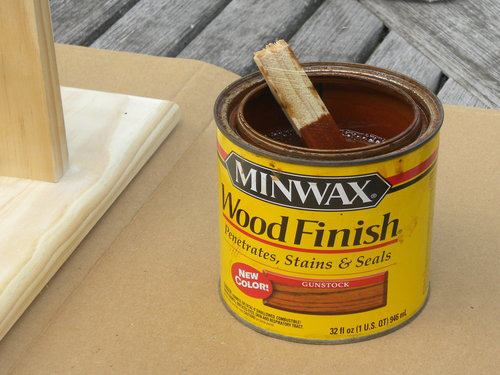 You can use an electric sander or do it by hand. I sanded this one with one of the new sponge sanding blocks. 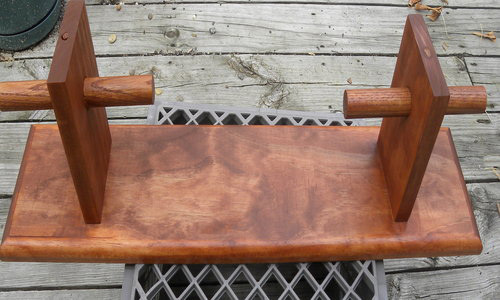 Then, you can paint or stain your bow rack to whatever color or design you wish. The one you see pictured below and was stained in the Minwax Gel Stain color Gun Stock and then it got a coat of satin finish polyurethane. 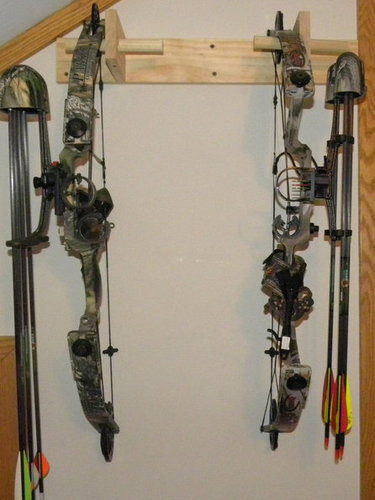 Finally, you can mount your bow rack on your wall just make sure your bow doesn’t hit the floor. I prefer to mount them straight to studs in the wall. Use 4 mounting screws of your choice but make sure they are 2″ long or longer and attack the bow rack to the wall.Wherever you have mounting screws that are not going into a stud, use wall anchors that will hold 50lbs or more! Here’s a picture of my current bow rack. I built it just like the one we put together, only faster and with scraps of wood I had laying around. It’s not as pretty, but I wanted to show you how it looks mounted to the wall. Hopefully this makes for a fun, easy project for all of the archers out there and maybe even helps make a little more room in your house! Good stuff, always nice to see practical constructions. But a couple of suggestions. You were concerned about the load rating for the wall anchors, I guess that would help with pullout, but if you are really that concerned with the load on the rack why not glue the boards together? Drywall screws into endgrain aren’t exactly going to support a whole lot. You could have used a jig for your drill (or a drill press) to ensure the holes for the larger dowels are perpendicular. I was thinking this too. 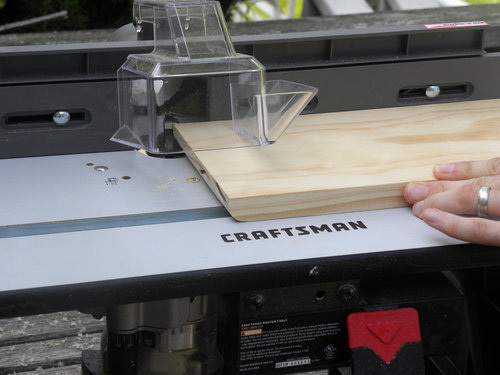 Another option would be to slot the back board using a jig saw and route the boards with a tongue to fit in the slot (if you have the router available). You could see use screws toward the outside. This definitely increases the work a good bit on this project, but with a change like that and a strong glue, you’d have a pretty strong creation. Thanks for the comment. I have built a few of these bow racks now (6 I think), and I agree with you. 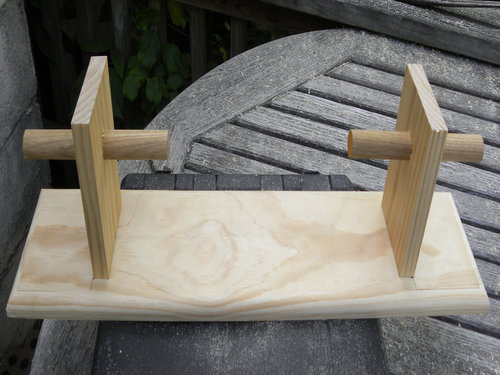 A drill press is the best tool for that step. I was just trying to let those who are not lucky enough to own one that they can do it with a standard drill driver as long as they are careful. As far as the anchors, I am not concerned so much about the drywall screws pulling out of the end grain as there is not that much weight. I only wanted to point out that with 4 bows that weak anchors in drywall will pull out. I was just trying to keep the less skilled from having problems 🙂 The average bow weights around 3 – 5 pounds with all accessories, so you might have 20lbs tops on the rack if you have 4 bows. So, use your best judgement when mounting it to a wall. I wanted this project to be something anyone could do with some basic tools, in a short time. That makes sense… toggle bolts or molly bolts would probably be the best if you cant hit a stud, but you should really try to hit at least one stud. Yeah, molly bolts would be a great option for sure. I try to hit studs on both sides as you can see in the last picture of the post. That is also why I made it the size and spacing of the 1×4 supports. This should allow you to hit two studs if your house has 16″ centers. A cheap drill guide like the one you provided a link to would be great! Nice bow rack. 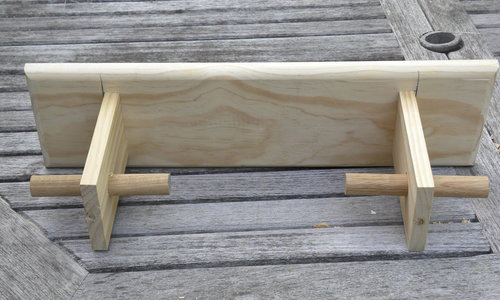 You may want to consider adding a piece of wood at the end of the dowel so the bow can’t accidently fall off. This way you would need to life up and over to remove the bow.